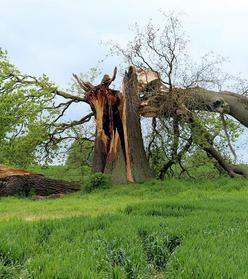 Emergency storm damage to your tree or yard can happen at any time. DO NOT GO NEAR A DOWNED TREE! If a tree has fallen in your yard or in your neighborhood call a professional tree service immediately to take care of the problem! 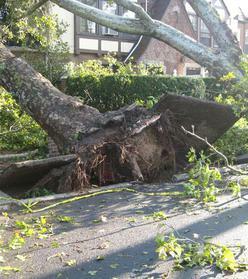 A tree has fallen on power wires: stay clear of the tree and the area. Branches can shift during a storm and cause the power wires to shift with them. Wait until the storm has cleared and call an emergency tree removal service to come and remove the tree safely. 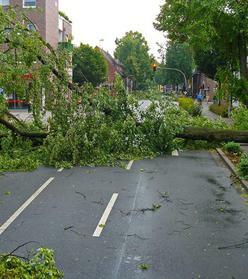 A tree has fallen across a road: Find a different path and report the problem. Do not attempt to move the tree out of the way to continue driving. There could be any number of things under the tree or around the tree that you are not aware of. Wait for a professional crew to take a look before you move the tree. A tree has fallen on your car: Stay clear of the car and do not attempt to go in the car to retrieve anything no matter how important you think it is. Trees can shift causing you to be pinned. Gasoline might be pouring out of a ruptured tank. Glass from the car can harm you. Let the car go, and call a professional emergency tree specialist to help. A tree has fallen on your house: If it is possible, get out of the house. A tree falling on a house can cause the structure of the home to be compromised. You don’t want to be under a compromised roof. Since tree and branch falling during a storm can be so unpredictable it is best to wait until the storm has cleared. U.S. Tree Service will work with your insurance company to ensure that you are taken care of when the unthinkable happens. If there is a need for you to have emergency tree removal call us today and we will be there for you.